1840 – James C. Harper deeded Fairfield Chapel to the trustees of Lenoir Circuit of the Methodist Episcopal Church, South. Fairfield Chapel was a log structure located on Beall St with an attached cemetery. The cemetery is still there. Lenoir Circuit was formed from a portion of the Morganton Circuit. 1841 – Annual Conference was held in Camden, SC. Rev Cornelius McLeod was appointed circuit minister. Same year, Lenoir was established as a town and the first county courts were held. 1845 – Fairfield Chapel congregation decided to build a new church. Col. William Davenport donated a lot at the corner of Church St and what is now Kirkwood St. Church construction began. 1846 – The first service was held in the new building on Dec 12. Rev Thomas W Postell and Rev Joseph Puett served as ministers. There were two entry doors – one for men and one for women. Men and women sat on opposite sides of the sanctuary. 1870 – Originally under the jurisdiction of the South Carolina Conference, Lenoir Circuit became a member of the North Carolina Conference. 1875 – At annual conference, Lenoir Methodist Church was made a station church. [This is a pastoral charge comprising only one local church; in contrast to a circuit, which contains two or more local churches.] Rev WM Robey was appointed full-time minister and served as president of Davenport Female College. 1876 – First Sunday school classes were held. 1879-1887 – Due to the transfer of Rev Robey and the 1877 fire at Davenport Female College, Lenoir Methodist became part of the Lenoir Circuit once again. 1887 – Lenoir Methodist changed back to a station church. Rev TN Ivey was appointed full-time minister. 1896-1898 – The 1846 church was remodeled, with new pews, improved lighting, heating plant and other modern amenities. Rev TA Boone was minister. These sketches of the 1846 church (left) and the 1898 church (right) were done by Kitty Huntley. 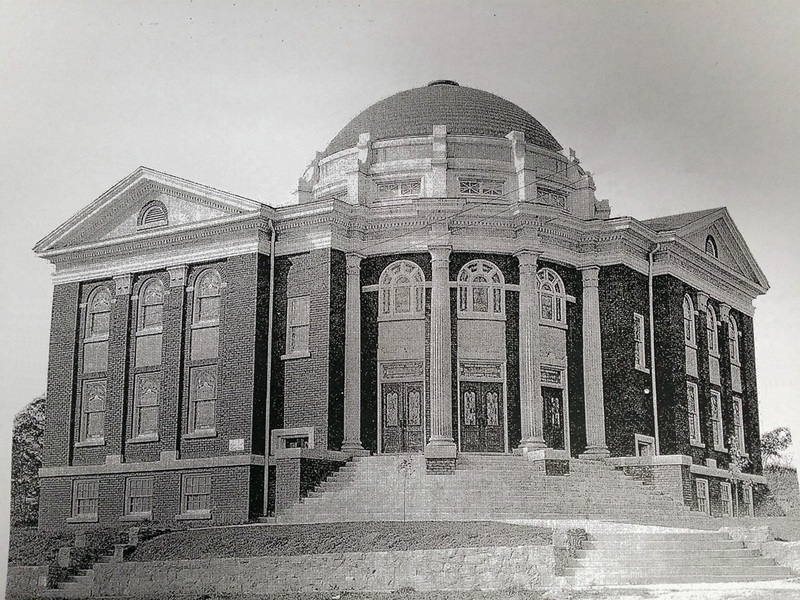 1898 – The first service was held in the new building. 1912 – A lot adjoining the 1898 church was purchased for $6,000. 1917 – On May 16, construction of the present-day church began on the empty lot. Total cost completely furnished was $32,000. The first brick was laid by Mrs. Rosannah (Uriah) Moore Cloyd, oldest congregational member at 89, blind, and only surviving member present when the 1846 church was built. The church cornerstone was formally laid on Sept 23 with Rev TN Ivey as guest speaker. A time capsule was placed behind the stone. The 1898 church was then used as a residence and later an apartment house. Cornerstone for 1918 church (left) and bell that resides in dome (right). 1918 – On Easter Sunday, March 31, the first service was held in the new church with Rev DM Litaker as minister. A farewell service was held on April 7 for the 1898 church. 1920 – A parsonage was built next to the church. 1946 – A centennial service was held on Dec 20 with Rev Frank C Smathers as minister. 1949 – The education building and chapel were completed. 1953 – Dedication of the 1949 building was held on Nov 22. The sermon was delivered by Bishop Costen J Harrell. Rev Harlan L Creech, Jr was minister. 1959-1961 – An addition was made to the 1949 building, plus construction of the Fellowship Hall. Rev Herman F Duncan was minister. 1968 – The General Conference of the Methodist Church was held in Dallas, TX. The denominations of Methodist and Evangelical United Brethren merged to become The United Methodist Church. Our church became the First United Methodist Church of Lenoir. 1970 – The church dome caught fire, necessitating major repairs. Up to that point, the dome was used for Sunday school and other meetings. It was never used again. The original bell, which rang on Sunday mornings to call people to church, still resides in the dome but remains silent. 1996 – Sesquicentennial celebration was held on May 19 with guest speaker Bishop Bevel Jones. Rev Robert W Combs was minister. 2002 – A groundbreaking service was held on April 24 for renovation of the 1918 sanctuary, the 1949 and 1959 buildings, and new construction of the Christian Life Center. Rev John Fowler was minister. The time capsule that was placed behind the cornerstone of the 1918 building was removed and stored in the historical archives. 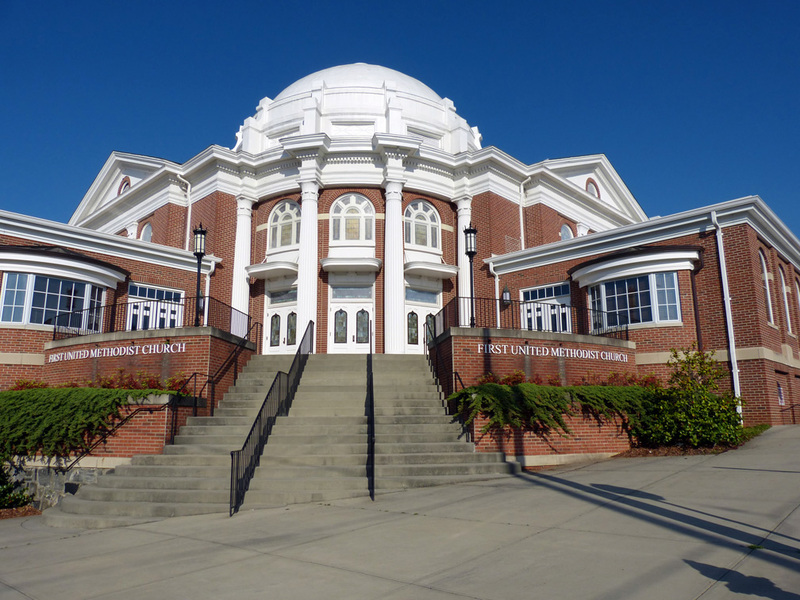 2003 – In March, the first worship services began in the new Christian Life Center (CLC), as renovations were underway on 1918 sanctuary. 2004 – The first services began in the newly renovated sanctuary. A consecration service was held on Sept 26 with Bishop Charlene P Krammerer as guest speaker. 2018 – A centennial celebration of the 1918 church building was held on April 15. Rev Linda Kelly was minister. This information was compiled from the following sources: FUMC-Lenoir history room, News Topic, One Hundred Fifty Years of Methodism on Church Street in Town of Lenoir by Genoise H. Davidson, and the Caldwell County Heritage Museum.